This article is about the men's team. For the women's team, see Spain women's national football team. The Spain national football team (Spanish: Selección Española de Fútbol)[a] represents Spain in international men's association football since 1920, and is controlled by the Royal Spanish Football Federation, the governing body for football in Spain. Spain is one of the eight national teams to have been crowned worldwide champions, having participated in a total of 15 of 21 FIFA World Cups and qualifying consistently since 1978. Spain also has won three continental titles, having appeared at 10 of 15 UEFA European Championships. Spain became the first European team to win a FIFA World Cup outside Europe, having won the 2010 tournament in South Africa, as well as having won back-to-back European titles in Euro 2008 and Euro 2012, defeating Germany and Italy in the respective finals, making them the only national team with three major titles in a row. According to this, from 2008 to 2013, the national team won the FIFA Team of the Year, the second-most of any nation, behind only Brazil. Also between November 2006 and June 2009, Spain went undefeated for a record-equalling 35 consecutive matches, a record shared with Brazil. Their achievements have led many experts and commentators to consider the 2008-2012 Spanish squads, among the best ever international sides in world football. Spain has been a member of FIFA since FIFA's foundation in 1904, even though the Spanish Football Federation was first established in 1909. The first Spain national football team was constituted in 1920, with the main objective of finding a team that would represent Spain at the Summer Olympics held in Belgium in that same year. Spain made their debut at the tournament on 28 August 1920 against Denmark, silver medalists at the last two Olympic tournaments. The Spanish managed to win that match by a scoreline of 1–0, eventually finishing with the silver medal. Spain qualified for their first FIFA World Cup in 1934, defeating Brazil in their first game and losing in a replay to the hosts and eventual champions Italy in the quarter-finals. The Spanish Civil War and World War II prevented Spain from playing any competitive matches between the 1934 World Cup and the 1950 edition's qualifiers. At the 1950 finals in Brazil, they topped their group to progress to the final round, then finished in fourth place. Until 2010, this had been Spain's highest finish in a FIFA World Cup finals, which had given them the name of the "underachievers". Spain won its first major international title when hosting the 1964 European Championship held in Spain, defeating the Soviet Union 2–1 in the final at the Santiago Bernabéu Stadium. The victory would stand as Spain's lone major title for 44 years. Spain was selected as host of the 1982 FIFA World Cup, reaching the second round, and four years later they reached the quarter-finals before a penalty shootout defeat to Belgium. Javier Clemente was appointed as Spain's coach in 1992, leading them to the quarter-finals of the 1994 World Cup. The match became controversial when Italian defender Mauro Tassotti struck Luis Enrique with his elbow inside Spain's penalty area, causing Luis Enrique to bleed profusely from his nose and mouth, but the foul was not noticed nor sanctioned by referee Sándor Puhl. Had the official acknowledged the foul, Spain would have merited a penalty kick. In the 2002 World Cup, Spain won its three group play matches, then defeated the Republic of Ireland on penalties in the second round. They faced co-hosts South Korea in the quarter-finals, losing in a shootout after having two goals controversially called back for alleged infractions during regular and extra time. At UEFA Euro 2008, Spain won all their games in Group D. Italy were the opponents in the quarter-final match, which Spain won 4–2 on penalties. They then met Russia again in the semi-final, beating them 3–0. In the final, Spain defeated Germany 1–0, with Fernando Torres scoring the only goal of the game. This was Spain's first major title since the 1964 European Championship. Xavi was awarded the player of the tournament. In the 2010 World Cup, Spain advanced to the final for the first time ever by defeating Germany 1–0. In the decisive match against the Netherlands, Andrés Iniesta scored the match's only goal, coming in extra time. Spain became the third team to win a World Cup outside their own continent, and the first European team to do so. Goalkeeper Iker Casillas won the golden glove for only conceding two goals during the tournament, while David Villa won the bronze ball and silver boot, tied for top scorer of the tournament. Spain qualified top of Group I in qualification for UEFA Euro 2012 with a perfect 100% record. They became the first team to retain the European Championship, winning the final 4–0 against Italy, while Fernando Torres won the Golden Boot for top scorer of the tournament. Two years later, however, they were eliminated from the group stage of the 2014 World Cup. At Euro 2016 and the 2018 World Cup, the side reached the last 16. Spanish team is commonly known by fans as "La Furia Roja", meaning The Red Fury in Spanish. However, there are another unofficial nicknames to refer to the national team of Spain. The other most common nickname, known by fans, is "Los Toros" (Fighting Bulls), since Spanish Fighting Bull is one of Spain's famous national treasures and often used to define Spanish culture, and also often depicted by Spanish supporters alike. Spanish football team is sometimes also referred as the Bulls due to this cultural heritage. Spanish team also received other nicknames, mostly "Toreros" or "Matador", both meanings are Bullfighters in Spanish, to describe its passionate and romantic style of football playing. During Spain's most successful period between 2008 and 2012, the team played a style of football dubbed 'tiki-taka', a systems approach to football founded upon the ideal of team unity and a comprehensive understanding in the geometry of space on a football field. Tiki-taka has been variously described as "a style of play based on making your way to the back of the net through short passing and movement", a "short passing style in which the ball is worked carefully through various channels", and a "nonsensical phrase that has come to mean short passing, patience and possession above all else". The style involves roaming movement and positional interchange amongst midfielders, moving the ball in intricate patterns, and sharp, one or two-touch passing. Tiki-taka is "both defensive and offensive in equal measure" – the team is always in possession, so doesn't need to switch between defending and attacking. Commentators have contrasted tiki-taka with "Route One physicality" and with the higher-tempo passing of Barcelona and Arsène Wenger's 2007–08 Arsenal side, which employed Cesc Fàbregas as the only channel between defence and attack. Tiki-taka is associated with flair, creativity, and touch, but can also be taken to a "slow, directionless extreme" that sacrifices effectiveness for aesthetics. Tiki-taka was successfully employed by the Spanish national team to win UEFA Euro 2008, 2010 FIFA World Cup and UEFA Euro 2012. The team of this era is regarded as being among the greatest international teams in history. They have the Barcelona "carousel" of Xavi and Andrés Iniesta augmented by Real Madrid's Xabi Alonso in midfield. —  Phil McNulty of the BBC on the midfield players at the heart of Spain's tiki-taka passing style of play. Sid Lowe identifies Luis Aragonés' tempering of tiki-taka with pragmatism as a key factor in Spain's success in Euro 2008. Aragonés used tiki-taka to "protect a defense that appeared suspect [...], maintain possession and dominate games" without taking the style to "evangelical extremes". None of Spain's first six goals in the tournament came from tiki-taka: five came from direct breaks and one from a set play. For Lowe, Spain's success in the 2010 World Cup was evidence of the meeting of two traditions in Spanish football: the "powerful, aggressive, direct" style that earned the silver medal-winning 1920 Antwerp Olympics team the nickname La Furia Roja ("The Red Fury") and the tiki-taka style of the contemporary Spanish team, which focused on a collective, short-passing, technical and possession-based game. Analyzing Spain's semi-final victory over Germany at the 2010 World Cup, Honigstein described the Spanish team's tiki-taka style as "the most difficult version of football possible: an uncompromising passing game, coupled with intense, high pressing". For Honigstein, tiki-taka is "a significant upgrade" of Total Football because it relies on ball movement rather than players switching position. Tiki-taka allowed Spain to "control both the ball and the opponent". We have the same idea as each other. Keep the ball, create movement around and off the ball, get in the spaces to cause danger. —  Xabi Alonso (Spanish midfielder). Wikimedia Commons has media related to Spain national football team kits. Spain's traditional kit is a red jersey with yellow trim, dark blue shorts and black socks, whilst their current away kit is all predominantly white. The colour of the socks altered throughout the 1990s from black to the same blue colour as the shorts, matching either the blue of the shorts or the red of the shirt until the mid-2010s when they returned to their traditional black. Spain's kits have been produced by manufacturers including Adidas (from 1981 until 1983), Le Coq Sportif (from 1983 until 1991) and Adidas once again (since 1991). Rather than displaying the logo of the Spanish football federation, Spain's jersey traditionally features the coat of arms of Spain over the left breast. After winning the 2010 World Cup, the World Cup winners badge was added to the right breast of the jersey and a golden star at the top of the Spanish coat of arms. 2015-09-08 2019–2026 (8 years) Undisclosed The previous Adidas Spain deal was due at the end of 2018 and worth a reported €24m a year. It's expected that the new Spain kit deal will be worth more than that. Spain does not have a designated national stadium, and as such, major qualifying matches are usually played at the Santiago Bernabéu Stadium in Madrid. The capital city Madrid (Bernabéu and Metropolitano), Seville (Pizjuán and Villamarín), Valencia (Mestalla and Orriols) and Barcelona (Camp Nou and Montjuïc), are the four Spanish cities that have hosted more than 15 national team matches, while also being home to the largest stadiums in the country. Other friendly matches, as well as qualifying fixtures against smaller opponents, are played in provincial stadia. The 2018 FIFA World Cup qualification campaign included matches at the Reino de León in León, Los Cármenes in Granada, El Molinón in Gijón, and the Rico Pérez in Alicante. Spain's UEFA European Qualifiers and UEFA Nations League matches, and all friendly games from 2018 until 2022, will be televised nationwide by La 1, flagship television channel of the public broadcaster TVE. The following players were called up to the Spain squad for the fixtures against Norway and Malta on 23 and 26 March 2019 respectively. Caps and goals correct as of: 26 March 2019, after the match against Malta. WD Player withdrew from the squad due to non-injury issue. Iker Casillas holds the record for most appearances for the Spanish team with 167 since 2000. He is one of thirteen Spanish players to have reached 100 caps. Sergio Ramos has played for Spain 162 times since his debut in 2005 and is the second most capped player. Xavi is third, having played 133 times between 2000 and 2014. 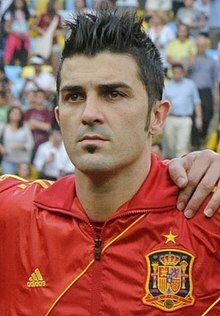 David Villa holds the title of Spain's highest goalscorer, scoring 59 goals since 2005, during which time he played for Spain on 98 occasions. Raúl González is the second highest goalscorer, scoring 44 goals in 102 appearances between 1996 and 2006. Fernando Torres is the third highest goalscorer with 38 goals in 110 appearances since 2003. Between November 2006 and June 2009, Spain went undefeated for a record-equaling 35 consecutive matches before their loss to the United States in the Confederations Cup, a record shared with Brazil, and included a record 15-game winning streak. In the 2010 FIFA World Cup, Spain became the first European national team to lift the World Cup trophy outside Europe; along with Brazil, Germany and Argentina, Spain is one of the four national teams to have won the FIFA World Cup outside its home continent. Below is a list of the ten players with the most caps for Spain, as of 23 March 2018[update]. Players in bold are still active at international level for the national team. Below is a list of the top ten goalscorers for Spain, as of 23 March 2019[update]. Denotes draws including knockout matches decided on penalty kicks. ^ Spain refused to travel to the Soviet Union for their qualification quarter-final, so Spain were disqualified and the Soviet Union were awarded a walkover victory. ^ a b ""La Roja"". 17 June 2010. Retrieved 30 June 2010. ^ a b "Statistics – Most-capped players". European football database. Retrieved 9 January 2016. ^ a b Since 1992, squads for Football at the Summer Olympics have been restricted to three players over the age of 23, which Javier will play in 2016. The achievements of such teams are not usually included in the statistics of the international team. ^ "Spain win again to extend unbeaten streak". CNN. 20 June 2009. ^ a b c d "Euro 2012: Are Spain the best team of all time?". BBC Sport. BBC. Retrieved 14 July 2012. ^ a b "Klinsmann: Spain win over Italy would make them team of century". BBC. Retrieved 14 July 2012. ^ a b "The greatest team of all time: Brazil 1970 v Spain 2012". The Independent. 3 July 2012. Retrieved 1 July 2013. ^ "Why this Spain side is all-time best". ESPN. Archived from the original on 6 July 2012. Retrieved 14 July 2012. ^ "Spain have reached end of an era, but their gift will not be forgotten - they forced all countries to raise their game". Telegraph. Retrieved 29 June 2014. ^ "Antwerp, 1920". FIFA. Retrieved 7 September 2015. ^ "Delight for the Azzurri as home advantage tells". FIFA. Retrieved 7 September 2015. ^ "Uruguay triumph brings heartbreak for Brazil". FIFA. Retrieved 7 September 2015. ^ Bull, JJ. "Xavi: The greatest midfielder of a generation". The Daily Telegraph. Retrieved 7 September 2015. ^ "Now you're gonna believe us: Spain are no longer the great under-achievers, says Casillas". Daily Mail. 30 June 2008. Retrieved 7 September 2015. ^ Sanghera, Mandeep (12 May 2012). "Euro 1964: A forgotten Spanish triumph". BBC Sport. Retrieved 7 September 2015. ^ Estepa, Javier. "Los penaltis cerraron las puertas de las 'semis' a La Roja" [Penalties close the doors to the semis for La Roja] (in Spanish). Marca. Retrieved 7 September 2015. ^ Jurado, J. Carlos. "El perdón de Luis Enrique a Tassotti que nunca llegó" [The pardon from Tassotti to Luis Enrique which never arrived] (in Spanish). Marca. Retrieved 7 September 2015. ^ Hayward, Paul (23 June 2002). "Korean miracle spoilt by refereeing farce". London: Telegraph. Retrieved 24 June 2012. ^ "Euro 2008 Final Preview: Germany vs Spain". 29 June 2008. Archived from the original on 29 December 2011. Retrieved 13 January 2012. ^ McNulty, Phil (29 June 2008). "Germany 0–1 Spain". BBC Sport. London. Retrieved 20 August 2009. ^ Spanish players named in the team of the tournament were: goalkeeper and captain Iker Casillas; defenders Carles Puyol and Carlos Marchena; midfielders Xavi, Cesc Fàbregas, Andrés Iniesta and Marcos Senna; and strikers David Villa and Fernando Torres. ^ "Systems Football: The Basics – Tiki-Taka / Totaal-Voetball. This system is highly influenced by Fc Barcelona passing game (already based on Dutch 70s football principles)". EPLindex. 16 July 2012. Retrieved 31 July 2012. ^ a b "New coaching breed gives heart to Spain". The Times. 14 April 2008. Retrieved 18 October 2010. ^ a b "Fábregas takes positive view, from the bench". The Guardian. 10 June 2008. Retrieved 13 July 2010. ^ a b c "The definitive story of how Aragonés led Spain to Euro 2008 glory". The Guardian. 2 July 2008. Retrieved 13 July 2010. ^ "If Spain can reign it will be so good for the old game". Sunday Mirror. 29 June 2008. Retrieved 13 July 2010. ^ a b "Beat Spain? It's hard enough to get the ball back, say defeated Germany". Daily Mail. 8 July 2010. Retrieved 13 July 2010. ^ a b "Why Spain were anything but boring". CBC.ca. 8 July 2010. Archived from the original on 1 January 2012. Retrieved 13 July 2010. ^ "Fantasy football comes alive". The Wall Street Journal. 31 March 2010. Retrieved 13 July 2010. ^ "Spain's "Tiki-taka" style dominates". SI.com. 9 July 2010. Retrieved 13 July 2010. ^ "Cuatro razones por las que la selección no tenga sede fija" (in Spanish). elespanol.com. 7 September 2017. ^ Bell, Arch (5 September 2016). "Exhibition from Spain in win vs Liechtenstein". Marca. Retrieved 27 July 2018. ^ "Macedonia 1-2 Spain 2018 World Cup Group G qualifier". Diario AS. 11 June 2017. Retrieved 27 July 2018. ^ "Israel arrive in Gijón with controversy in the air". Diario AS. 22 March 2017. Retrieved 27 July 2018. ^ "Spain 3–0 Albania". BBC Sport. 6 October 2017. Retrieved 27 July 2018. ^ "TVE adquiere los derechos de la selección nacional de fútbol hasta 2022" (in Spanish). RTVE. 28 September 2017. ^ "Luis Enrique presenta su colección de convocados para Norway y Valencia". Royal Spanish Football Federation. Retrieved 15 March 2019. ^ "Estos son los dorsales para los encuentros frente a Noruega y Malta". Royal Spanish Football Federation. Retrieved 20 March 2019. ^ "Ranking – Played Matches". BDFUTBOL. Retrieved 28 December 2015. ^ "Spain national football team goal scorers". European football database. Retrieved 9 January 2016. ^ "Ranking – Goals". BDFUTBOL. Retrieved 28 December 2015. ^ "Reports for all official matches". eu-football.info. ^ "Mediterranean Cup and Mediterranean Games – Overview". Rec.Sport.Soccer Statistics Foundation. Wikimedia Commons has media related to Spain national association football team.